When Henry David Thoreau didn't feel like paying his taxes to protest the Mexican War, he was famously arrested and spent a night in jail. He live-tweeted this as the founding document of American civil disobedience, cleverly titled "Civil Disobedience." It influenced Gandhi, Martin Luther King, and any 1980s sitcom with a "very special episode" in which the kids learn about the '60s by protesting something and get arrested, as their once-hippie parents join in and/or have to explain wistfully at the end that somehow, things have changed. I reference Gandhi, King, and the first two seasons of Family Ties not because I put myself in their tradition—that would involve going to jail 'n stuff and the closest I've come to being imprisoned is sitting through Meet Joe Black—but because somewhere, sometimes things get so stupid you can't help but not take a stand. As of this writing, the government has been closed down for eleven days because the Speaker of the House (I won't use names) just really, really, reeeally doesn't like a three-year-old law. By this point, the shutdown has evolved from cute snowday to stupid inconvenience to national embarrassment to international disgrace. The best part is, the Speaker (still not using names) and all of his party members have all but conceded they're done protesting the three-year-old law but still refuse to end the shutdown or give a reason why they won't. If they weren't already in politics, I'd say they have a future in politics. Which brings me to myself. As a resident of Washington, D.C., I am disgraced at my government's inability to, well, govern. I decided I should make some sort of protest. I thought about what I could do. I could go down and protest at the Capitol, but that would involve leaving my house, and with the Metro's funding on life-support, I'm not positive I could get back home. I could call my local federal representatives, only the District of Columbia doesn't have any. I could even go to the Mall the set myself aflame, but then all of the hipster protesters would be like, "It's been done." Unclear of what to do, I consulted my usual spiritual leader in times of crisis: Father Mulcahy. There's this episode of M*A*S*H where Hawkeye and BJ can't stand Charles playing his French horn, so they protest by refusing to shower until he stops playing. (Apparently this is one of those convenient gaps where a week goes by with no fighting or patients, which does help to explain how they stretched out a two-and-a-half year war for eleven seasons.) Banished from the mess tent for their odor, they invite Father Mulcahy to eat with them outside. He politely defers. BJ reminds him, "Jesus ate with the lepers." Mulcahy considers that for a moment and says, "He was an exceptionally good sport." Considering my wife gets mad when I don't clip my toenails, I knew that not showering was out. But I had been putting off shaving for the first few days of the shutdown, and after remembering how Eddie Vedder grew a mohawk to protest Bush invading Iraq, I realized that I could register my protest by refusing to shave. I'd call it "No Shave-Down 'til There's No Shut-Down." This is the kind of thing that begs for social media documentation, but that would require taking "selfies," which I generally protest more than the government shutting down. So after testing the water with a Facebook post, I decided to follow it up with this, since I wanted to write about the shutdown in some way or another. Thus, my facial hair is both a protest and a documentation of the time spent with no government. If things keep going how they're going, I could eventually start a ZZ Top tribute band (called AA Bottom, 'natch). Besides, cool people have beards. Like our first president to have facial hair, Abraham Lincoln. And he was a trendsetter in more ways than one: After him, every president following had facial hair with the exception of Andrew Johnson (who was impeached) and William McKinley (who was shot), until Woodrow Wilson (who was, um, stroked?). Since Wilson, there's been nary a chief executive whisker since. Wait. Does that make Wilson the most influential president since Lincoln? I think I just blew my mind. But I digress, mainly because Lincoln's on everyone's mind nowadays. "Today there is a New Confederacy," announced a recent op-ed in the Washington Post, "an insurgent political force that has captured the Republican party and . . . has accomplished what its predecessor could not: It has shut down the federal government, and without even firing a weapon or taking 620,000 lives, as did the Old Confederacy's instigated Civil War." But if anyone's starting a Civil War, it's the Republicans on themselves. I'm half expecting the Tea Party to fire upon whatever is the equivalent of the "mainstream" (ha!) Republicans' Fort Sumter (the Bush family ranch? The Ronald Reagan Presidential Library? The Barry Goldwater Whatever He Has?). The Post op-ed was likely responding to an unnamed GOP Rep who compared the shutdown to Gettysburg—with the Republicans as the Confederates. I understand if you like the idea of still calling yourself "Lincoln's Party," but at this point, you either look like you're stupid or you don't care (not that those two are necessarily mutually exclusive). And with George Will comparing Obamacare to the Fugitive Slave Act, it doesn't look like it's gonna end anytime soon. Oops, said I wouldn't name names. Well, George Will is a jackass. Thoreau put it this way: "If the tax-gatherer, or any other public officer, asks me, as one has done, 'But what shall I do?' my answer is, 'If you really wish to do anything, resign your office.' When the subject has refused allegiance, and the officer has left his office, then the revolution is accomplished. But even suppose blood should flow. Is there not a sort of blood shed when the conscience is wounded? Through this wound a man's real manhood and immortality flow out, and he bleeds to an everlasting death. I see this blood flowing now." Thoreau's words are like finding a snippet Quentin Tarantino dialog in the middle of Walden. They also predict the Civil War by about two decades, not to mention Lincoln's masterpiece, his Second Inaugural Address. But even if the Confederacy was never able to shutdown the government, I would like to note that this last Congress has passed the fewest amount of bills of any Congress since 1861—which arguably makes it the most divided government since the Civil War. 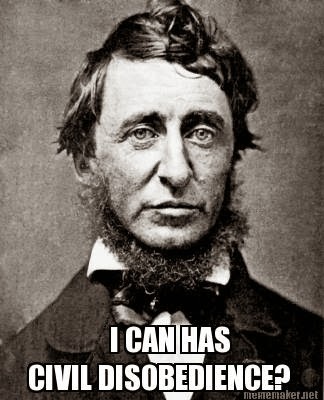 Thus, in the spirit of Thoreau, I would like to take his words—"Resign your office"—and say them to the Speaker. Because, at the end of the day, it's my God-given right as a freedom-loving American to do something that great Americans have done now for generations: Shave. Lou Reed, Vocalist: An Appreciation.